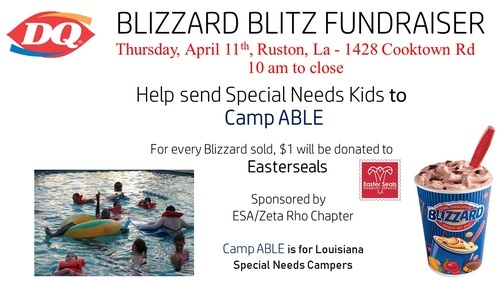 A Blizzard Blitz fundraiser set for April 11 will support special needs children attending Camp ABLE. The camp is held at Camp Hardtner in Pollock and is a project of Louisiana Easter Seals. Sponsor of the event is the Zeta Rho chapter of the service group Epsilon Sigma Alpha. From each Blizzard ice cream treat sold at Dairy Queen at 1428 Cooktown Road in Ruston, $1 will be donated to the cause. No flier or mention of the fundraiser is required when ordering. The event will last from 10 a.m. until closing. Easter Seals has been one of ESA International's projects since 1984, with members helping raise more than $5.9 million. Thursday, April 11, 10 a.m.-11 p.m.